Scent Description This English wildflower lends the woods a sweet, magical fragrance with it's tiny white bell-shaped hanging flowers. 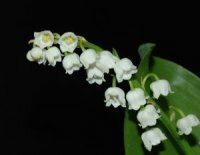 Smells just like the classic perfume Muguet des Bois bu Coty. Worked great in my cold proc. soap. Great fragrance. sweet a little like honeysuckel, but not overpowering at all. Great classic! One of my favorite scents - have sold out every time I make it! Burns nicely in a 4oz Square Mason Jar when using EZ Parasoy at 1oz fragrance/1lb wax, with a CD-14 wick (a CD-12 didn't melt all the way out on all sides). It's a really nice fragrance! Not overpowering at all like many floral scents.